This is and has been THE family tradition cake for at least 45 years. Five plus pounds of rich, chocolate cake. Slice the servings very, very thin. Pretty icing on the top of the cake. …as in, this has been driving me crazy for years! No one can make the cake like Mama did, and she can no longer offer instructions. This year was about the 4th year to try this beast of a cake. Monday night, I baked the cake in a bundt pan, I think to exert my power. (I’ll show you, you thin, moist cake layers of Granny’s past.) The cake was very firm, actually hard, on the outside. I tasted a pinch of the cake; it tasted like cardboard. It contains a cup of crisco; what can taste good with that much crisco? I deviated from Mom’s icing recipe slightly, and was pleased with the result. I had great icing on a bundt that I had sliced into three very uneven layers. 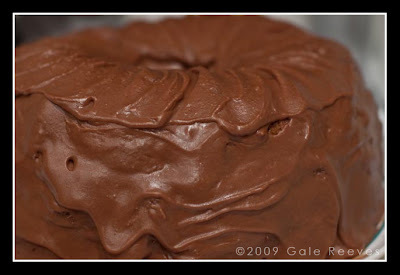 As an aside, carefully mark the layers if you slice a bundt. Otherwise, the wheel of a bundt becomes a puzzle; needless to say, I didn’t put the puzzle back together correctly. It’s now Wednesday night before Thanksgiving. Nephew is expecting Milky Way cake (like Granny’s %*$&%#). I have an uneven mound of dark chocolate mass that looks like it has a cyst on the top (thank you, Brother, for pointing that out). Cardboard with good icing in an ugly shape…headed home for Thanksgiving. 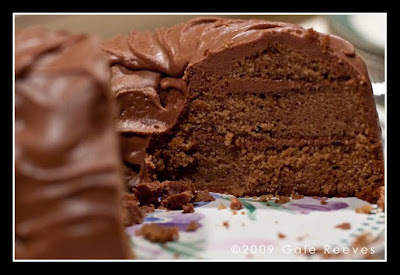 By some Miracle!, the warm, moist icing soaked into the cardboard cake layers, and resulted in a heavy, dense, moist Milky Way cake with good (soft on the inside, hard on the outside) icing. Brother gave me a 96%; would have given 100% he said, had the cake not had a cyst on the top. So, after years of trying – - success. Even though the (my) cake is not very pretty, it is really delicious. A small piece goes a long way, for it is very rich. 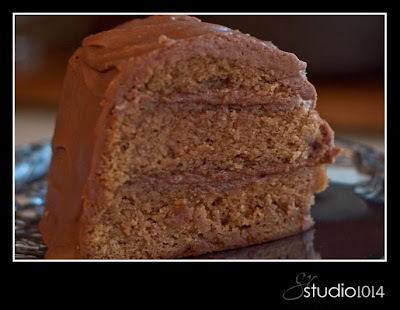 Chocolate lovers should try this recipe. Combine sugar and evaporated milk; cook to soft ball stage. Remove from heat; add butter, marshmallow cream, and chocolate chips. Frost cake. Work quickly; this icing sets up very fast. The result will be a Dense, Moist, Rich, Chocolate cake. …and a memory…..